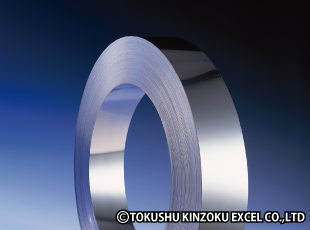 Precipitation Hardening Stainless Steels (SUS631,632J1,TOKKIN™ 350) | TOKUSHU KINZOKU EXCEL CO.,LTD. *Precipitation hardening refers to a process in which a material is artificially age-hardened (precipitation hardened) after solution heat treatment. Typical precipitation hardening stainless steels include JIS 600 grades (such as SUS631, SUS632J1, and TOKKIN™ 350) and maraging steel. These grades were developed with the concept of steels that are easy to form like austenitic stainless steels, and provide high strength like that of martensitic stainless steels. Maintaining the superior properties of 18–8 stainless, SUS631 is the most common precipitation hardening stainless steel that can be hardened through heat treatment. It can be subjected to a variety of heat treatment processes to suit working and applications from the softest solution heat treatment to a hard full-hardened finish. This allows it to acquire strength second only to quenched high-carbon martensitic stainless steels. In a solution-heat-treated state, SUS631 is non-magnetic, but demonstrates quite strong magnetic properties after precipitation hardening. Although SUS631 becomes soft and can be processed in a variety of ways when solution heat treated, it requires an intermediate heat treatment to harden. Even when solution heat treated, SUS632J1 is hard at normal temperature, and the only heat treatment subsequently required is a single precipitation hardening operation, which makes it simple to process. It has a low carbon content and provides toughness after solution heat treatment, so it can withstand light processing. SUS632J1 can be finished as solution heat treated or as rolled. When produced with an as rolled finish, it can acquire greater strength, but is not as strong as SUS631. It demonstrates strong magnetic properties in all conditions. TOKKIN™ 350 corresponds to JIS SUS633, and is a chromium–nickel–molybdenum stainless steel. It has excellent workability when solution heat treated or annealed, and boasts high strength when heat treated. It also has excellent yield strength and cyclic fatigue strength. > Click here to learn about " How is TOKKIN™ 350 different from other precipitation hardening stainless steels?" What is the difference between SUS631 and SUS632J1? The main differences between SUS631 and SUS632J1 are outlined below. The graph below on the left "Cold Rolling and Mechanical Properties" indicates reduction ratio - hardness and hardness after precipitation hardening. For SUS631 C (dotted line) hardness increases as the reduction rate increases, but for SUS632J1 C (solid line) hardness does not increase to the same extent as SUS631 C as the reduction rate increases. SUS632J1 can acquire a certain degree of strength without extensive cold working and experiences little increase in hardness due to cold working. It is therefore recommended for applications where directional properties, formability, or punchability are concerns. When H treatment (precipitation hardening) is applied to SUS631 C, the hardness of the material will increase by around 80–90 HV at most (with a higher reduction ratio resulting in a higher increase in hardness after H treatment). However, the hardness of SUS632J1 increases by 150 HV or more regardless of the reduction rate. However, when TH1050 or RH950 treatment is applied to SUS631 A (a soft material with a hardness of 200 HV or below), it is possible to significantly increase hardness. SUS631 A is therefore recommended for complex shapes. However, when processing A materials, martempering (T treatment, R treatment) must be performed before H treatment, so careful attention should be paid to heat treatment conditions. *For information on heat treatment conditions for SUS631, refer to the Heat Treatment tab. Generally, it is 3/4H finish, but we can also be manufactured in other hardness. Precipitation hardening refers to a process in which a material is artificially age-hardened (precipitation hardened) after solution heat treatment. Typical precipitation hardening stainless steels include JIS 600 grades (such as SUS631, SUS632J2, and SUS633) and maraging steel. Consequently, it is only necessary to perform a single precipitation hardening treatment before use. *The number after TH, RH, and CH indicates the temperature of the precipitation hardening treatment in degrees Fahrenheit. *Precipitation hardening cannot be accomplished simply by applying H treatment to a solidified material (A material). *SUS631 and SUS632J1 require different heat treatment conditions. *We do not have facilities for TH and RH hardening treatments. Please perform these heat treatments yourself. Heat treatment conditions for SUS632J1 are as indicated below. Since the heat treatment temperature is quite high, it is recommended that treatment is performed in as bright an atmosphere as possible (for example, in a vacuum or in H2, N2, or AX gas). If coloring occurs, The kind of low-temperature scale that occurs during H treatment can be removed by washing with (A) 10% hydrochloric acid → 30% nitric acid or (B) 15% nitric acid + 2% hydrofluoric acid (nitric hydrofluoric acid). The kind of high-temperature scale that occurs in T or R treatments can be removed by washing with (A) caustic soda + 30% molten salt of sodium nitrate → nitric hydrofluoric acid or (B) 10% caustic soda + a boiling solution of 3% potassium permanganate → nitric hydrofluoric acid.Scale can also be removed by mechanical polishing, blasting, peeling, or other methods. (2) When cooling the material to a low temperature during R treatment (sub-zero treatment), simply putting alcohol or a mixture of acetone and dry ice in a heat-resistant container makes it possible to obtain an appropriate temperature of around -73°C. When processing large amounts of materials continuously, a freezer is used. Whereas austenitic structures are non-magnetic, martensitic structures are strongly magnetic (although not to the same extent as ferritic structures). For this reason, SUS631, which is weakly magnetic when solidified, takes on strong magnetic properties after precipitation hardening. Most of the magnetic properties of the material are acquired during martempering, so there is not much change during H treatment. TOKKIN™ 350 provides excellent oxidation-resistant properties and weldability for a precipitation hardening stainless steel.